As the busy capital of São Miguel, Ponta Delgada represents the most visited place on the island. Known for its historical buildings, the city offers 17th- and 18th-century convents and churches, as well as cobbled pedestrian streets and hidden squares. 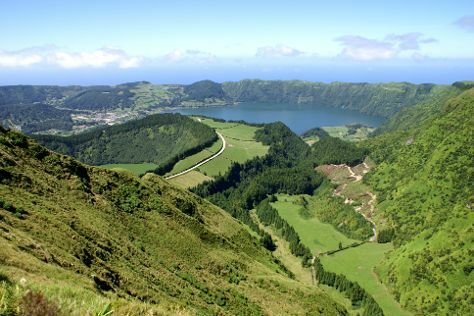 Get in touch with nature at Caldeira das Sete Cidades and Poca Da Dona Beija. Step out of Ponta Delgada to go to Furnas and see Terra Nostra Gardens, which is approximately 46 minutes away. And it doesn't end there: explore the activities along Lagoa do Fogo, take in the architecture and atmosphere at Igreja Matriz de Sao Sebastiao, look for all kinds of wild species at Environmental Interpretation Centre of Caldeira Velha, and enjoy the sand and surf at Praia de Santa Barbara. To find photos, maps, reviews, and more tourist information, use the Ponta Delgada trip planning app . Philadelphia, USA to Ponta Delgada is an approximately 11-hour flight. You can also do a combination of train and flight. The time zone difference when traveling from Philadelphia to Ponta Delgada is 4 hours. Traveling from Philadelphia in May, you will find days in Ponta Delgada are slightly colder (66°F), and nights are about the same (58°F). Finish up your sightseeing early on the 10th (Thu) so you can travel to Porto. On the 10th (Thu), take in panoramic vistas at Clerigos Tower, then admire the landmark architecture of Palacio da Bolsa, and then contemplate the waterfront views at Rio Douro. For where to stay, traveler tips, photos, and tourist information, refer to the Porto online tour itinerary planner . Getting from Ponta Delgada to Porto by flight takes about 5.5 hours. The time zone changes from Azores Time (AZOT) to Western European Time (WET), which is usually a 1 hour difference. Plan for a bit cooler nights when traveling from Ponta Delgada in May since evenings lows in Porto dip to 52°F. Wrap up your sightseeing on the 11th (Fri) early enough to travel to Lisbon. Satisfy your inner culture vulture at Belém Tower and Carmo Archaeological Museum. Get outdoors at Lisbon by Boat and Praia de Carcavelos. 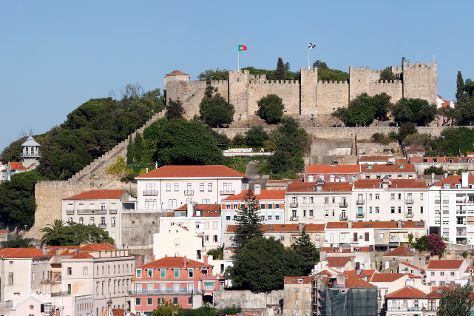 There's much more to do: explore the historical opulence of Castelo de S. Jorge, see Pypas Cruises, get interesting insight from Portugal Bike, and appreciate the history behind Padrao dos Descobrimentos. For maps, other places to visit, photos, and more tourist information, read Lisbon trip itinerary tool . Traveling by flight from Porto to Lisbon takes 2.5 hours. Alternatively, you can take a train; or drive. Traveling from Porto in May, you will find days in Lisbon are a bit warmer (75°F), and nights are about the same (55°F). Wrap up your sightseeing by early afternoon on the 15th (Tue) to allow enough time to travel back home.